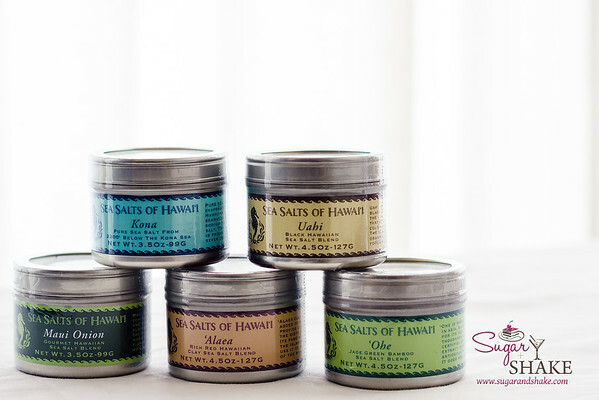 Shake got samples of Sea Salts of Hawai‘i’s variety packs for a photo shoot recently and I got to keep them to play with! 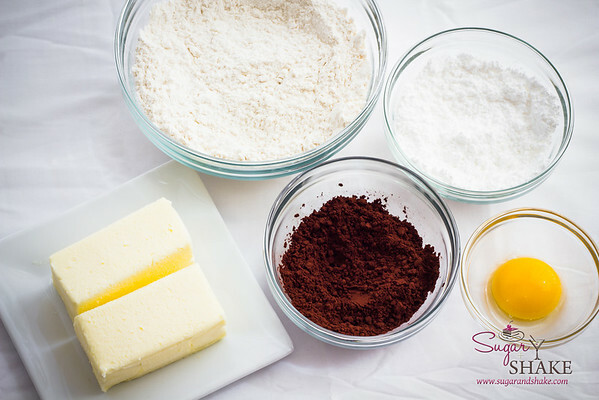 What to make, what to make…? Cookies!! Who doesn’t love cookies, right? Honestly, I don’t know how I got the idea to do these; I think I was looking for a recipe for something else and while doing that, stumbled into this Dorie Greenspan recipe for Chocolate-Cayenne Cocktail Cookies featured in Food & Wine. 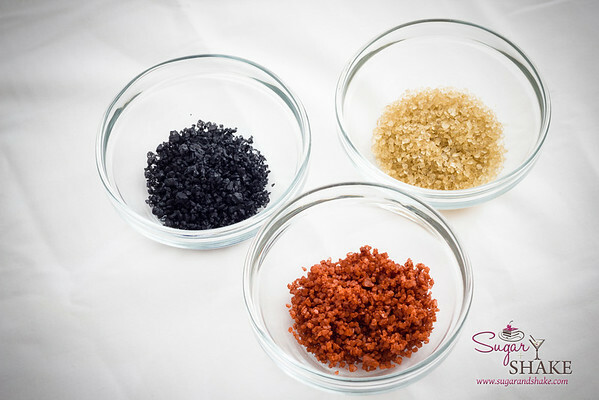 I nixed the cayenne pepper because I wanted to showcase the different flavors of salts. For the same reason, I also split the recipe to make a plain batch and a cocoa batch. 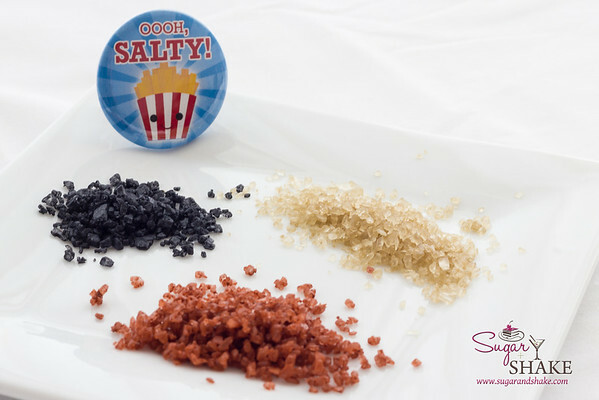 (I like salt and chocolate together, but I wanted to see how the different salts tasted.) 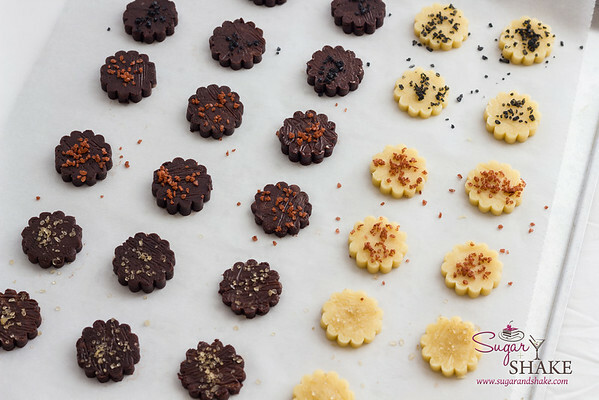 The recipe yields dry, crumbly cookies that are rather shortbread-like and not very sweet. I made dinner for Shake’s co-workers (it was a late-night deadline day and ever since I won a slow-cooker from Pass the Sushi, I’ve been using it at the office to make dinner every other month) and brought these cookies for dessert. I forgot to explain what they were, so Shake’s art director was a little startled when he popped one into his mouth. “I fawf it wa’ gonna be fweet! Ith not sugar!” he exclaimed through a mouthful of cookie crumbs. Oops. Yeah. Salt. Not sugar. My bad. The salts are such pretty colors, they really do look like decorating sugar. So be kind and let folks know before you serve these. Gratuitous cutesy photo alert: We’ve had this adorable little fridge magnet for a long time and I knew that whatever I made with the salts, I wanted to incorporate it into the photos. The artist who created it is Kat Uno. Her designs are CRAZY CUTE! I didn’t make any changes to the original Dorie Greenspan recipe, other than omitting the cayenne and making half the batch without cocoa powder, so you can get the recipe from Food & Wine if you want to try your hand at these. Black Uahi — Made with Moloka‘i sea salt and activated coconut-shell charcoal. This one has a sharp flavor. (It’ll also turn your fingers and tongue black, by the way.) It went well with the cocoa cookies. I like this on raw ‘ahi. Green ‘Ohe — Also made with Moloka‘i sea salt, this one is infused with certiﬁed-organic bamboo leaf extract. (It looks more beige than green.) It has a definite vegetal taste and isn’t as sharp as the black salt. I would use this for more delicate items, like fish or poultry, rather than beef. The cocoa cookies overwhelmed this one; it was better on the plain batch. Red ‘Alaea — made with Hawaiian volcanic clay; the clay has a high iron content, which is where the red color comes from. It has a pronounced minerally taste. Don’t worry; it doesn’t taste like dirt at all. I liked this on both the plain and the cocoa cookies equally well. FYI, sea salt has a tendency to stick, unlike regular table salt or other mass-produced salts you usually buy for cooking. When you open up a tin, it will most likely be a compact puck that takes some effort to break up, at least initially. This is totally normal. Incidentally, this moisture content is also why this kind of salt is nice for finishing dishes—it won’t dissolve away, so you can taste it AND see it. 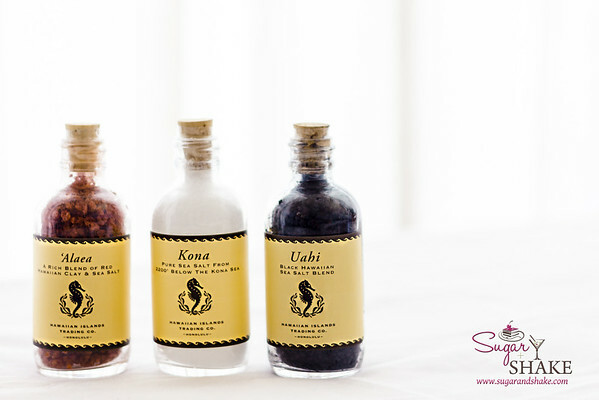 We happen to have an extra “Blue Box Gift Set” with the cute cork-stoppered bottles of Kona, ‘Alaea and Uahi salts…so I’m giving it away here on the blog! Aw, thanks, Kim! I think yours is fantastic! 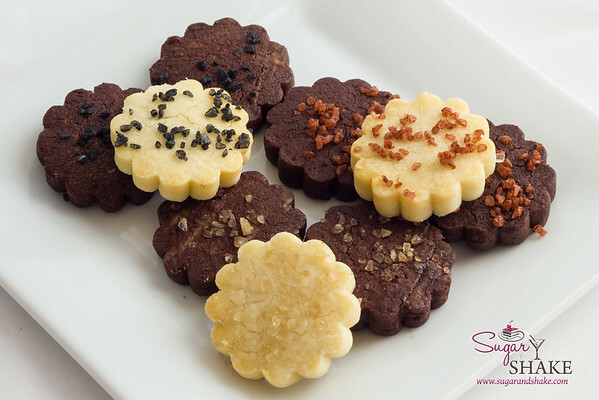 So, what’s your favorite salty treat? 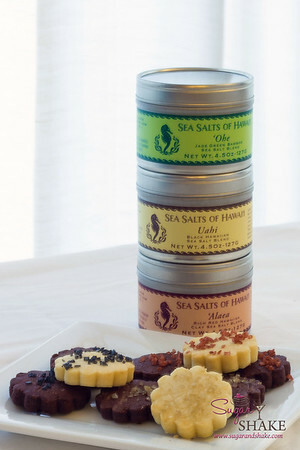 My favorite salty treat is Li Hing Mui! I never really thought of li hing mui as a “salty” thing, more “sweet & sour” — but you’re totally right! It IS salty! Wow, that’s a healthy salty “treat”! 😉 But vegetables and salt do work together so nicely. I read a cooking magazine interview with a chef once (can’t remember who) and he suggested sprinkling fine sea salt on a salad when you dress it because it helps bring out the flavor. I tried it, and he was right — it’s so much tastier that way! oh yeah I really like your fb page, and I ‘liked’ it, too! 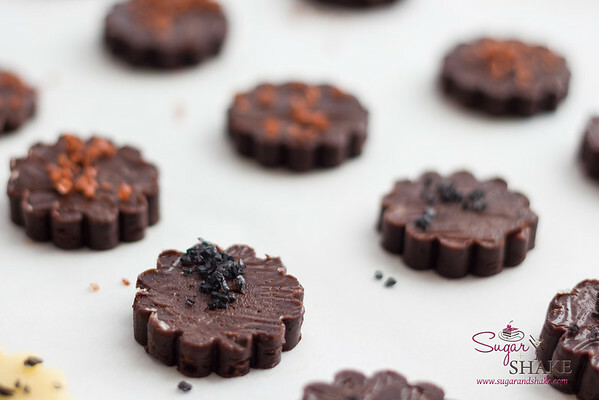 Dark chocolate with a touch of sea salt. I love plain potater chipies! Like regular ruffles. Simple salty goodness! Argh, now *I* want Ruffles! !